New York: US stocks opened higher on Monday, as optimism of a robust holiday season powered gains in shares of retailers and technology stocks bounced back after a brutal sell-off last week. The Dow Jones Industrial Average rose 344.59 points, or 1.42 per cent, at 6.52pm (GMT+4). The S&P 500 opened higher by 26.06 points, or 0.99 per cent, at 2,649.97. The Nasdaq Composite gained 87.51 points, or 1.26 per cent, to 7,026.50 at the opening bell. Analysts predict on Monday, also known as Cyber Monday, one of the busiest retails days of the year, could be the largest sales day ever. Shares of e-commerce giant Amazon.com Inc jumped 2.1 per cent and eBay Inc gained 1.9 per cent in premarket trading. Other retailers, including Best Buy Inc, Walmart Inc and Target Corp, also rose around 1 per cent each. “We had a pretty miserable week in terms of the equity markets and sometimes you get a relief rally, markets could be bouncing a little bit based on that,” said Randy Frederick, vice-president of trading and derivatives for Charles Schwab in Austin, Texas. 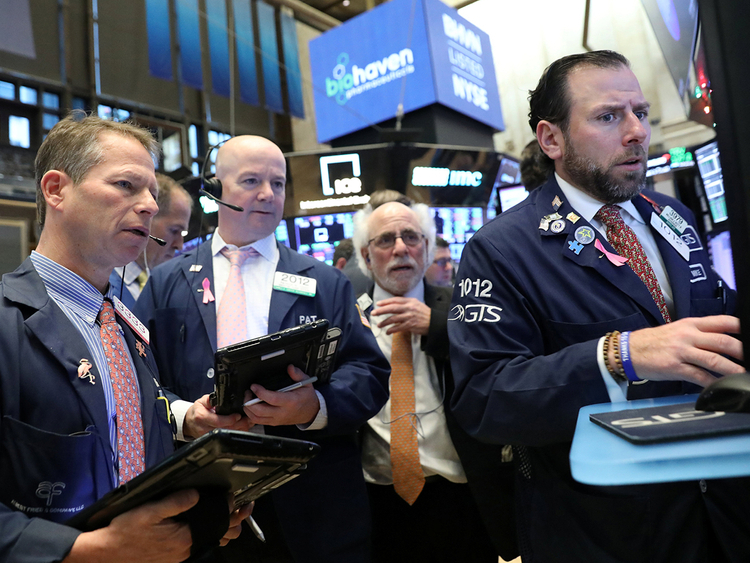 Wall Street’s main indexes fell more than 3 per cent last week, with the Dow and the Nasdaq posting their biggest weekly percentage declines since March, on plunging oil prices, worries about slowing global growth and peaking corporate earnings. The S&P 500 on Friday closed 10.2 per cent lower from its record closing high on Sept. 20, confirming a correction for the second time in the year. At 8.37am ET, Dow e-minis were up 239 points, or 0.99 per cent. S&P 500 e-minis were up 28.25 points, or 1.07 per cent and Nasdaq 100 e-minis were up 97.5 points, or 1.49 per cent. Oil prices rose, paring some its losses from the near-7 per cent fall on Friday, lifting Dow components Exxon Mobil Corp up 0.9 per cent and Chevron Corp 1.0 per cent. Other members of the so-called FAANG group also rose, with shares of Facebook Inc, Apple Inc, Netflix Inc and Google-parent Alphabet gaining between 1 per cent and 2 per cent. Also on the forefront of investors’ minds is the G20 summit this week, where US President Donald Trump and his Chinese counterpart Xi Jinping are expected to hold trade talks in Buenos Aires, Argentina. Among other stocks, Nvidia Corp rose 2.7 per cent after Credit Suisse initiated coverage on the chip designer’s shares with an “outperform” rating and said the recent weakness in shares provide a compelling entry point. Smaller rival Advanced Micro Devices also gained 3.2 per cent.